GBA operates two cafeterias on Capitol Hill and the surrounding areas. 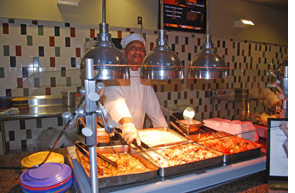 Food Services are provided by Eurest Dining, a division of the Compass Group. Located on the 1st floor of the 244 Washington Street building. Located in the Floyd Building across from the State Capitol.